9/15/08 Update: The Microsoft unit test framework now has its own MSDN Code Gallery site, where you'll find the latest framework releases and other information. 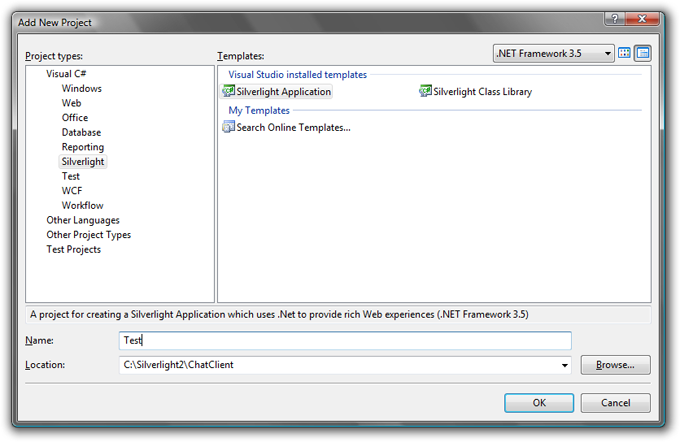 http://code.msdn.microsoft.com/silverlightut/ 1/6/09 Update: Updated templates are available that should be used for the final Silverlight 2 release. Please see the MSDN Code Gallery site and/or this post from October '08. 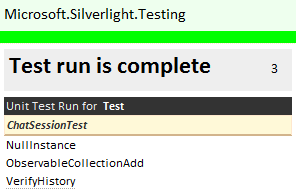 Test-driven development is something that every developer can appreciate once they’ve tried it, and something that I’ve worked hard to enable for Silverlight with the release of the controls source. Scott Guthrie previously posted about the Silverlight 2 Beta 1 release, with a First Look at Silverlight 2 post followed by the First Look at Using Expression Blend with Silverlight 2. If we could take the same application from the Blend post & create a set of unit tests for the components in the app, it would pay dividends once we start adding new features or working with other developers on the project. If you’d like to hear more about any part of the framework, let me know in the comments and I’ll come back with that information. Previous posts that may be helpful if you don’t have time to complete this tutorial today: a video walkthrough of the control unit tests, and a quick introduction to the unit testing bits with download locations and installation instructions. 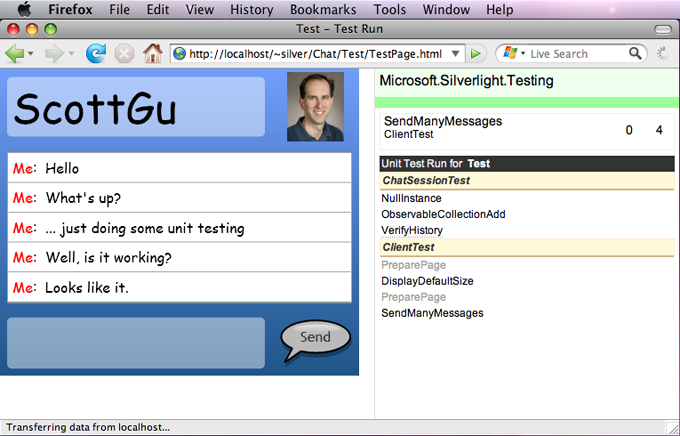 At MIX we released source code to the controls, unit tests, and we including a unit test framework that runs in the web browser using Silverlight on the Mac and PC. 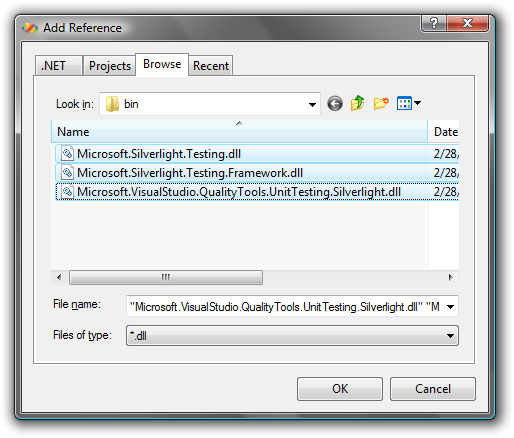 The Microsoft.Silverlight.Testing framework is simple, easy-to-use, and will give developers yet another way to increase their productivity and application quality. In today's post we’ll take our working chat interface from Scott’s last tutorial, improve its testability, and add some simple tests. At the end we’ll have a set of cross-platform, cross-browser tests that can run everywhere: The framework will be familiar to anyone who's used the desktop unit testing tools inside Visual Studio Team Test (and also now available with Visual Studio 2008 Professional): the same types and attributes are available for unit testing now in Silverlight. Having unit tests is extremely useful because the more test scenarios you create, the more confidence you'll have when adding features and fixing bugs, especially if you're working with a team of developers. 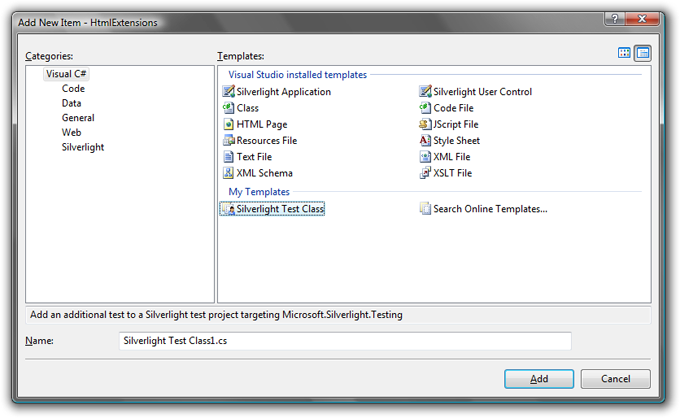 Since the test projects are packaged like any other Silverlight application, there's no special installation process to run the tests. 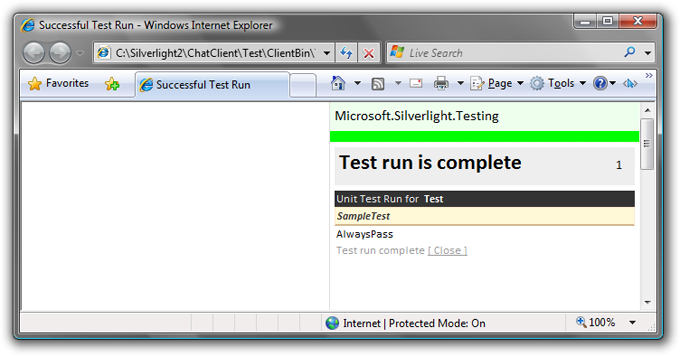 On the Silverlight controls team we've built thousands of these tests! A PDF of this tutorial is also available for download here. At the end of ScottGu’s last post, we were in Visual Studio, having just hooked up the UI data binding and wiring up the SendButton's Click method. There are now two choices we have for adding a ‘test project’ to the solution. Option 1 will explain how the testing hooks up to run in the browser. Option 2 (skip ahead) is what you’d probably actually want to do. 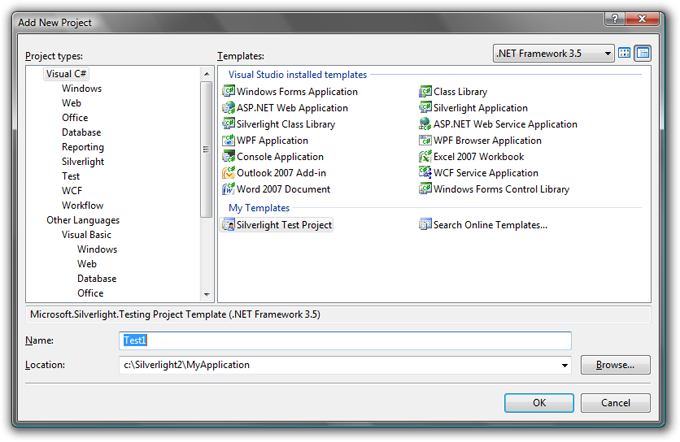 We'll create a new test project by selecting the File->Add->Project menu item within Visual Studio 2008. 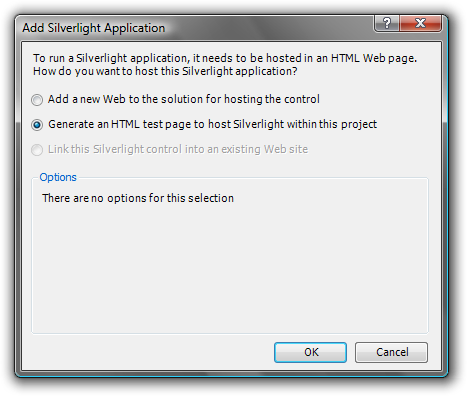 Inside the New Project dialog, drill down into the Silverlight project types and select "Silverlight Application": Note: Make sure not to accidentally select the "Test" project types, since that's for the desktop framework and not Silverlight. 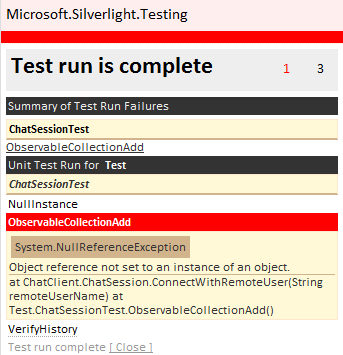 Silverlight unit test projects are not integrated with Visual Studio, so the integrated test features will not work-Silverlight unit tests run in the web browser host. We'll name the project "Test", although if your solution has many discrete components, you may want to pick a better identifier. 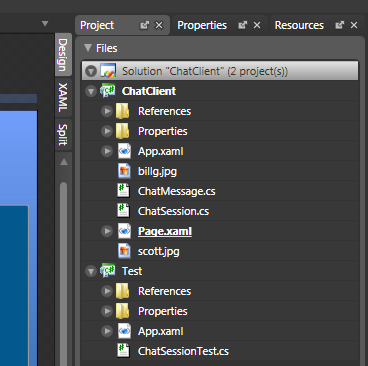 When we click the "OK" button, Visual Studio will ask us to choose the type of application project. To keep it simple, let's just use the option to automatically generate an HTML test page: After clicking "OK", we'll then have 2 projects within the ChatClient solution. 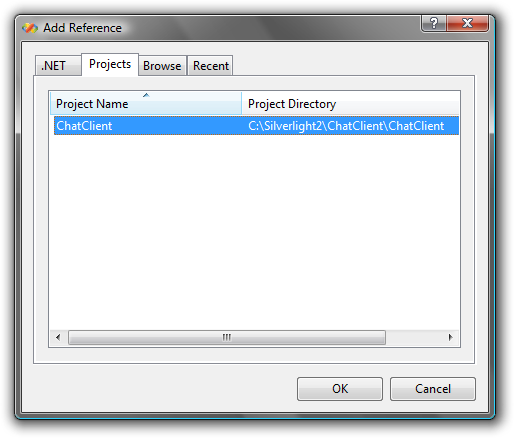 You can switch between the startup projects by right-clicking on either the ChatClient or Test project and choosing "Set StartUp Project". 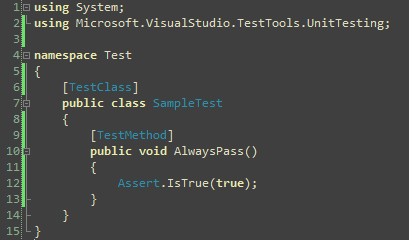 Next up, adding the unit test assemblies. The unit test framework is being provided as a download separate from the SDK, as part of the control source code package that you can download here. If we place the test framework assemblies in a directory within the solution, we can then add them as references to the test project by going to the Project->Add Reference menu item and then clicking on the "Browse" tab and finding that folder: Select all three of the files and click "OK". Replace the RootVisual with a call to UnitTestSystem.CreateTestPage. 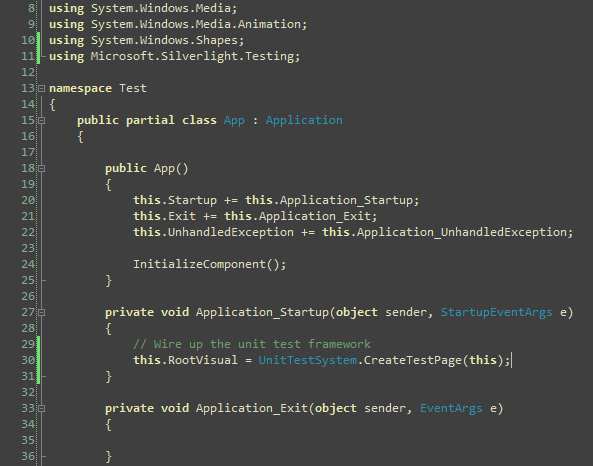 The parameter to the method enables the framework's test engine to reflect on your test assembly. Here's the updated App.xaml.cs: Now we’re ready to start adding tests. It’s much easier to use Visual Studio project templates to do all the work above. Previously posted about here. 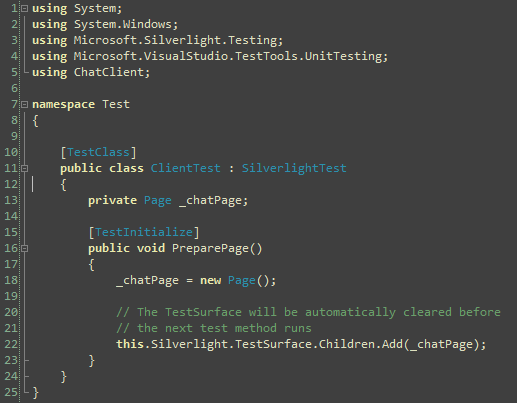 Now that we know how to prepare a test project, add test classes, and run the tests, we can add some useful tests. A well-designed application might follow a Model-View pattern that decouples the UI. Not only does this make development easier, but using this common pattern will make our application easier to test. Thankfully our chat client that we built previously did make use of data binding to abstract away the underlying application state from the user interface. assertions have been added in for robustness. the SendMessage method on the ChatSession instance is called, which should immediately fire the CollectionChanged event and call the delegate that we wired up to the change event. To make sure all the tests are passing before continuing, build the project and press F5 to run the tests: Surprisingly, we have a unit test failure! The log now has a summary of the failures (this is useful if running thousands of tests), and the failing method has some exception information. Some quick analysis will show us that inside ChatSession.cs's ConnectWithRemoteUser method, we're assuming that the PropertyChanged event handler is not null: The fix is to encase the event handler calls with a check for null: After marking the fix, a quick F5 run of the tests will confirm our fix: Now we have some good API tests that are well suited for testing Silverlight class library projects, including validating data structures and business objects. Having a large suite of such tests will give us a lot more confidence when we add the complexity of the user interface into the equation. Beyond API tests, you can also build tests that simulate user activity by calling methods that glue together your interface with your application logic. You can examine the visual tree, modify control properties, and perform a number of useful tests with your application code. Although we aren't looking to simulate mouse events or key presses, we can still validate a large set of the functionality in our chat app by programming against the Page type defined in ChatClient. 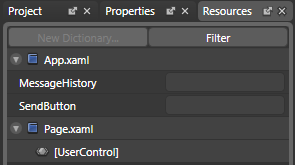 Since we defined a number of application resources inside the App.xaml file for the chat client, these key resources that define the history view and send button won't be available to our test application (they're separate apps). 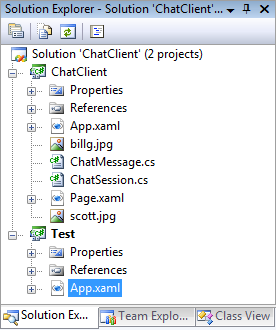 To demonstrate testing our ChatClient’s Page, which makes up the bulk of our ‘app’, we'll need to move the resources from App.xaml to Page.xaml inside the chat client project. This is actually extremely easy to do using Expression Blend (or manually, using the XAML text editor in Visual Studio and some cut-and-paste). We should open up Expression Blend 2.5 March 2008 Preview again and open our ChatClient solution. Inside, we can double-click on Page.xaml to open that view again. The first thing you'll notice is that the test project is also now available inside Expression Blend: If we wanted to run the tests right now, we could right-click on the test project, set is as the Startup Project, and then if we went to the Project->Test Solution menu item (or pressed F5), all of our unit tests would run without us having to be in Visual Studio, a good time saver. To move the two application resources from the application level to the page level, we need to click on the Resources tab in the upper right corner of Blend. Then, expand both the App.xaml and Page.xaml elements so that we can see all of the available resources: Now we just have to select each resource individually and drag them into the Page.xaml area. 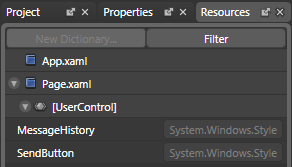 The resources should now look like this: Go ahead and exit Blend now, saving your changes to App.xaml and Page.xaml. Optionally, you could also spend time to jump into the visual tree and verify the various control values. This is pretty straightforward. To call the SendButton_Click method we need to make it an internal method, so go back into Page.xaml.cs for the chat application and make that change: Next, back inside our ClientTest.cs file, let's add a helper method called SendMessage that works with the text box and calls the SendButton_Click method. 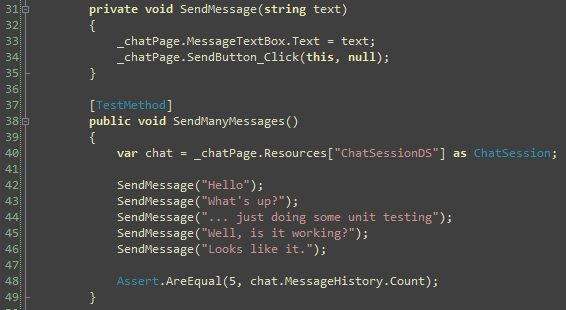 Then we can write a quick string of calls to SendMessage and then verify the result in the data source: That's it! We now have an end-to-end test that sends messages within the app. To perform some final testing, we could either press F5 to debug and run the test project, or navigate to the test project's page with another browser such as Firefox or Safari. On my machine the test page for the test project is located in "C:\Silverlight2\ChatClient\Test\ClientBin\TestPage.html". The good and bad news is that if we run these tests, they happen extremely fast. You can efficiently easily run thousands of tests using this simple in-browser test experience. Here's what it would look like if we froze the screen right when the SendManyMessages test ran on my Mac Pro: There's a lot of useful functionality in the unit test framework, including the same metadata and assertions as the desktop's. I'll be including more information about this framework on my blog.